No, look at this car because it shows how EVs could kill traditional combustion-engine cars sooner than we might think. Because Faraday Future isn’t just about making a fast car for rich people, although that’s what will come out first (in “a couple of years,” to quote FF executive Nick Sampson). 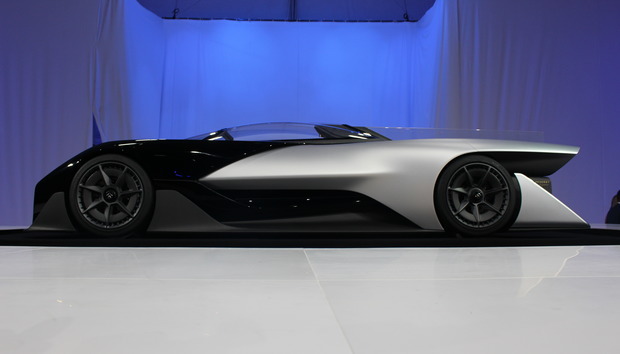 The FFZero1 concept from Faraday Future has inspired many comparisons to the Batmobile. FF wants to make a mass-market EV—like Tesla, but with even more money to put behind the idea, and no patience for the slow growth of current EVs (even the top-selling Nissan Leaf has a minute slice of the overall car market). The Tesla parallels are not coincidental. Just as Musk’s personal wealth started Tesla, another billionaire’s pile of cash led to Faraday Future’s birth a scant 18 months ago. Faraday Future also poached a very important executive from Tesla: Nick Sampson, who was Director of Vehicle and Chassis Engineering at Tesla and is now Senior Vice President of R&D and Engineering at Faraday Future. Another top executive is Global Design head Richard Kim, who had a hand in BMW’s i3 and i8 electric cars. Also like Tesla, Faraday Future is starting with something flashy (Tesla’s first car was built inside the shell of a Lotus Elise). The FFZero1 concept looks like a better-designed Batmobile, sleek where the latter was chunky, yet still very aggressive-looking. Built into that swoopy exterior are “aero tunnels” that help pull air over the batteries and improve the aerodynamics. We’ve seen similar design elements in the Ford GT supercar. The exterior will use carbon fiber and “lightweight composite construction” (not surprising). The powertrain will include a high-performance racing suspension and what FF calls “advanced vehicle dynamic control and torque vectoring” (one of the most wonderful things about EVs is instant torque). The cockpit looks insane: bright-white as if someone else will always clean it, and room for just one person, who will recline at a 45-degree angle and control the car using an airplane-like, semi-circular steering wheel, a slender band of digital readouts along the windshield line, and a head-up display. The Faraday Future FFZero1’s cockpit features an airplane-like steering wheel and a sleek band of digital dashboard data at the windshield line. Most of this exterior stuff probably won’t end up in the normal cars Faraday Future aims to produce later, but much of the guts likely will. Faraday devised what it calls Variable Platform Architecture to make it easier to build more kinds of cars on the same basic underpinnings. Faraday Future’s Variable Platform Architecture aims to produce EVs faster by using the same chassis to make many different cars. Think Ford’s “World Car” strategy, where it tries to deploy one basic car design globally, only even more flexible. Depending on the car it wants to design, FF can tweak battery and motor configuration, vehicle size, and even drivetrain type. The picture below shows how in the VPA design, the batteries will run along the bottom of the car, like in the Tesla Model S, to save space and create a nice, low center of gravity. Faraday has yet to provide any range information, though, and the world will be waiting for that. Faraday Future’s banking on its Variable Platform Architecture to help it build more mainstream EVs on a faster development schedule. Note the battery array along the bottom of this chassis, to lower the center of gravity. Theoretically, you could build an EV minivan on the same platform as the FFZero1, just by adjusting the recipe. That’s the real promise of Faraday Future’s concept car. The one thing Tesla still has that Faraday Future doesn’t is an Elon Musk: a leader who isn’t simply rich, but who has the brains and talent to apply directly to the dream, rather than just fund it. Tesla execs may come and go, but as long as Musk remains I’m sure Tesla will survive. Faraday Future could stumble if Nick Sampson leaves, and it’s already lost its battery wizard, as Bloomberg reported. Traditional car people will examine the FFZero1’s speed specs, critique the aerodynamics, or chuckle at the precious cockpit. That’s their right, but they’re missing the real point. This fancy car is driving an almost folksy dream to make EVs for everyone. We’re not there yet with the current generation of EVs, so there’s every reason to remain skeptical. Faraday has some interesting new ideas, though, and as Elon Musk has already proven, a dream backed by money and smarts has a good chance. This detail shows the FFZero1’s name, discreetly painted onto the rear bumper of Faraday Future’s EV concept.